Unlike most paths in Chiricahua National Monument, the Silver Spur-Faraway Trail (also known as the Silver Spur Meadow Trail) does not encounter any volcanic rock formations, instead visiting three historic sites - two chimneys from a Civilian Conservation Corps (CCC) camp established in the 1930s, a log cabin built in 1880 and, the main structure, a pioneer homestead, Faraway Ranch, which includes a two story dwelling and various outhouses. 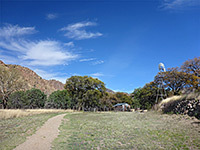 The path is 1.4 miles long and mostly level, passing through woodland and meadows close to the usually dry Bonita Creek, at the mouth of Bonita Canyon. 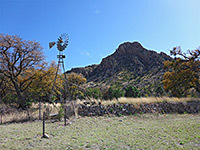 The three sites can also be seen by shorter hikes - the ranch and the cabin starting from a pull-out near the park entrance, and the chimneys beginning at the visitor center, but the full walk allows a greater appreciation of the peaceful canyon floor, and passes more of the approximately 240 plant species that grow here. Eroded formations can still be glimpsed in a few places above the trees, on the slopes of Riggs Mountain to the north and Garfield Peak to the south. Light snow may be present in the winter but the trail is generally accessible all year. Map of Chiricahua National Monument. 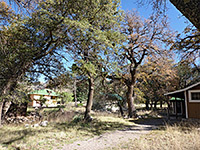 The western trailhead is along a little side road near Faraway Ranch, 0.7 miles from the park entrance station, and from here, the ranch (the only destination for most visitors) is 800 feet away, while the cabin is just less than half a mile. 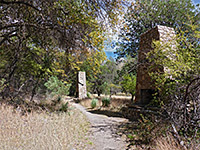 The other end of the trail begins 100 feet west of the turn-off for the visitor center, from where the two chimneys are reached after 0.3 miles, at the edge of Silver Spur Meadow, a small open area in the otherwise wooded terrain bordering Bonita Creek. The east end of the trail is marked by a sign along the park road just west of the bridge over Madrone Creek. The path enters quite thick oak woodland and soon crosses the creekbed - usually a dry corridor of light grey boulders - and meets a connecting path from Bonita Canyon campground. 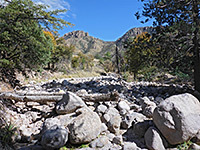 This is followed by another wash crossing, the slightly narrower Bonita Creek, after which the route bends to the west and approaches Silver Spur Meadow, which is filled with long grass and home to many wildflowers in wetter years. 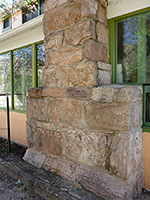 On the north side of the meadow are two fireplaces beneath stone chimneys, the most visible remnants of the CCC camp which was established here in the 1930s. 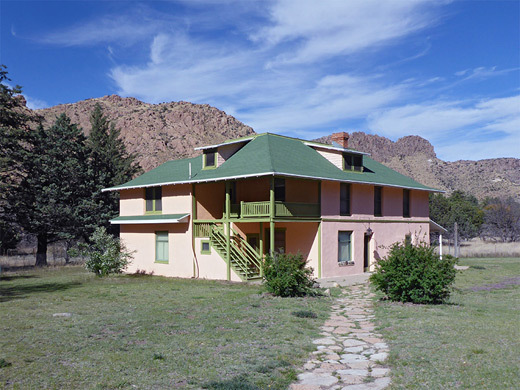 The chimneys were part of a guest ranch that was in operation from 1948 to 1968; most was demolished soon after the closure, following its acquisition by the National Park Service. There is one other, less obvious structure nearby; a small brick enclosure in front of an alcove in the cliffs on the north side of the valley, temporary home for a black bear cub that lived here in the 1930s and became partly tame. West of the meadow, the path recrosses Bonita Creek, moves further through the forest for a short distance, meets an NPS service road, and continues on the far side, coming close to a rock outcrop to the south, before emerging into more open land, where it divides. Both branches lead to Faraway Ranch not far ahead, but only the north fork passes Stafford Cabin, a well presented log building with stone chimneys, built in 1880 as a homestead for Ja Hu Stafford and his wife Pauline. The cabin initially consisted just of a single room, but was extended in 1886 by addition of a larger room on the north side. 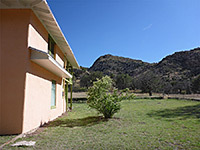 The home was later used as lodging for guests of the nearby ranch, which lies a third of a mile west, reached after a short walk through partly wooded grassland. 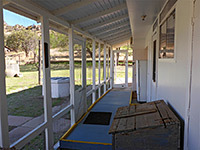 The main building at Faraway Ranch is a square, two floor house, of board and batten construction, with open balconies on the first floor and covered verandas on two sides of the ground floor. These are open at all times, while the interior, all of which is fully furnished with original artefacts, may be viewed on guided tours, usually staged on Saturdays and Sundays. 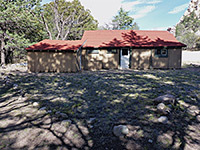 The house and all nearby buildings have been restored by the NPS; other structures include a barn, cabin, generator house, corral, and several sheds and garages. 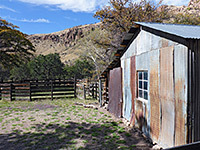 The ranch was established in 1886 by Swedish immigrants Neil and Emma Erickson, later passing to their daughter Lillian who helped maintain the property, latterly as a guest ranch, until her death in 1977; one year later the buildings were sold to the park service, and have remained unoccupied.